Figure 9. An aerial view of Buffalo Mountain. Courtesy of Natural Concepts. Mr. Chairman and Gentlemen: I plead guilty to the soft impeachment. I am from East Tennessee. Evidently the distinguished soldier proposing that toast was not himself born breathing the pure air of the mountains. At least I understand he was reared in the sluggish atmosphere of a lagoon far back in the swamps of Mississippi. Yes, I was born in East Tennessee – on the banks of the Watauga which in the Indian vernacular means beautiful river. And beautiful river it is! Standing upon its banks in my childhood, I have looked down through its glassy waters and beheld a heaven below and then looking up beheld a heaven above, reflecting like two great mirrors each into the other its moon and planets and trembling stars! Away from its banks of rock and cliff, cedar, hemlock and laurel, stretches a vale back to the distant mountains, more beautiful than any in Italy or Switzerland. There stand the great Unaka, the great Roan, the great Black and the great Smoky Mountains, among the loftiest in America, on whose summits the clouds gather of their own accord even on the brightest day. There I have seen the great Spirit of the Storm after noon-tide go take his evening nap in his pavilion of darkness and of clouds. Then I have seen him aroused at midnight like a giant refreshed by slumber, covering the heavens with gloom and greater darkness, as he awoke the tempest and let loose the red lightings that ran along the mountain tops for a thousand miles swifter than an eagle’s flight in heaven! And now the lightening would stand up and dance like angels of light in the clouds to the music of that grand organ of nature whose keys seemed touched by the fingers of Divinity in the hall of eternity, sounding and resounding in notes of thunder through the universe! Then I have seen the darkness drift away, and the morn getting up from her saffron bed, like a queen put on her robes of light, come forth from her palace in the sun and tiptoe on the misty mountain top, whilst night fled before her glorious face to his bed chamber at the pole, as she lighted the beautiful river and the green vale where I was born and played in childhood with a smile of sunshine. O beautiful land of the mountains with thy sun-painted cliffs how can I ever forget thee! Figure 10. Commencement Ceremony. 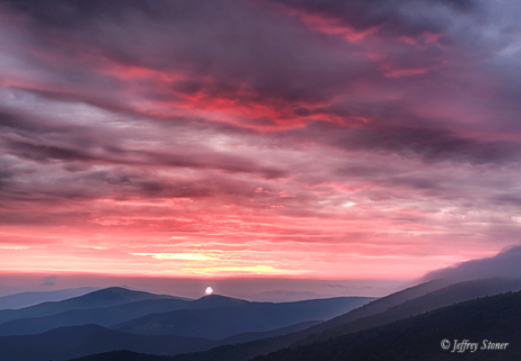 A sunrise in the Great Smoky Mountains. Haynes, Landon Carter: Emory & Henry College Archives, Tipton-Haynes Historic Site Civil War Exhibit Collection, Tipton-Haynes State Historic Site, Johnson City, Tennessee.